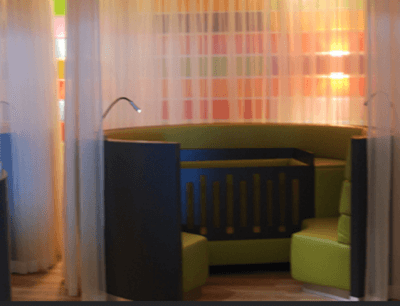 When you are planning ahead for a trip with the three of you, a stop (over) at Amsterdam Schiphol Airport in the Netherlands gets more interesting with their new “Babycare Lounge by Nutricia”. Nutricia is a baby food brand.In the Babycare Lounge parents can take care of their babies (in private), bathe them, feed them and/or allow them to sleep for a while in one of the seven bed cabins, which include comfortable seats for the parents. In the hectic airport environment, the Babycare Lounge is a haven of peace and quiet where parents can get their breath back while their babies are comfortably asleep or playing. The Babycare Lounge is designed by Marjolein Vreeburg of MV Architects. At their website you will find more images of the Babycare Lounge.